Wu Didi was born in Chong Qing in 1976. She graduated from the Sichuan Academy of Fine Arts High School in 1996, and received her BA degree from Central Academy of Fine Arts, Beijing. 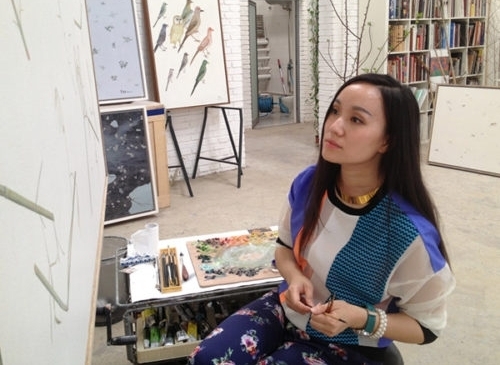 In 2004, she earned her Master’s Degree from CAFA Oil Painting Department. She currently teaches at the Central Academy of Dramatic Art. Wu Didi is known for her poetic nature studies in which the absence of context leads to concentration on the specificities of natural forms that are generally overlooked. In her recent work, Wu's focus has been on hanging vines, and sawed apart trunks and branches of trees. She endeavors to investigate the nature of plants through actions such as breaking, twisting and bending and tries to convey their toughness and resilience in her paintings. In contrast to the rough surfaces of trees and vines, delicate spider webs and insects invariably appear within her canvases, adding motion to her otherwise static compositions, and signifying life and rebirth in nature.